Knee pain has become a common problem now both among young and old. The reasons can be many such as knee disorders, overactivity, acute injuries, etc., which lead to difficulty in walking, swelling, severe pain, etc. to get relief from pain, doctors advise medications, compression, exercises as solutions. However, there is one solution which brings in long-term relief without any side effects. Acupressure is an ancient healing therapy that requires physical pressure on certain points of the body to restore relief and cure several health issues. This therapy has been proved to be very effective for curing knee pains. 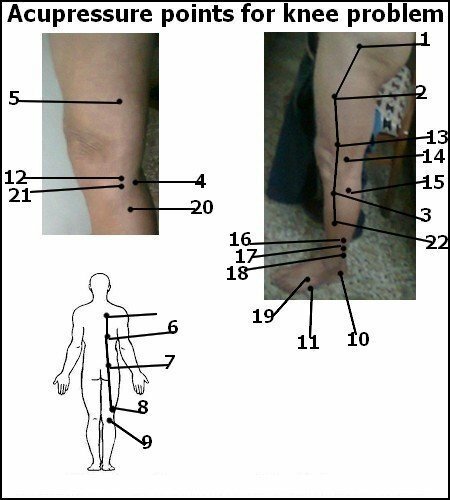 Read further to discover the essential pressure points and ways to use acupressure to get fast relief from knee pain. Acupressure involves pressing of acupoints by using fingers or tool made for acupressure which is helpful in self-healing and preventive health care without any side effects. You should apply pressure on the points and on nearby area. The spot that is most pressure-sensitive is the required acupoint to treat the health issue. Acu-points are given in the figure. All these points are bi-focal that means both sides of the body. There are some precautions to treat any health issue with acupressure. This ancient healing procedure is absolutely safe. For more information, please see the image provided here and gets relief from Knee pain. In case of severe problems, you should see a doctor. Information provided by acupressure specialist Mr.M.R.Monga. He is 86 years old and has a vast knowledge of acupressure and treated thousands of people free of charge. Thankfulness to my father who told me concerning this weblog, this web site is in fact awesome.